Remember back when everyone was predicting that this would be a warmer than average winter? Yeah, so did I! Well, we haven’t had any full on -40C days yet, so I’m thankful for that! Winters in Manitoba are cold, long and even depressing and gloomy - but hey.. we’re Manitoba! That being said, every winter I crave a nice hot vacation or a strong heavy Belgian ale that tops out at around 12 percent ABV. Unfortunately I’m too broke for a hot vacation - even though I’m heading to Montreal and Vermont on Monday for poutine, smoked meat sandwiches, beer and iced cider. I wish there was a tropical paradise that had a rich craft brewing history.. oh wait, Hawaii has several! Not only that, Maui Brewing out of Kihei on Maui Island in Hawaii has two completely opposite beers that you can find locally - CoConut Porter, a rich robust porter that has rich notes of toasted coconut, freshly roasted coffee and a hint of dark chocolate. I sampled this beer at Torque Brewing’s Brewmaster Matt’s place on New Years Day and enjoyed every sip of it.. though I wish it had more of an abundance of toasted coconut as it was slim to nil. 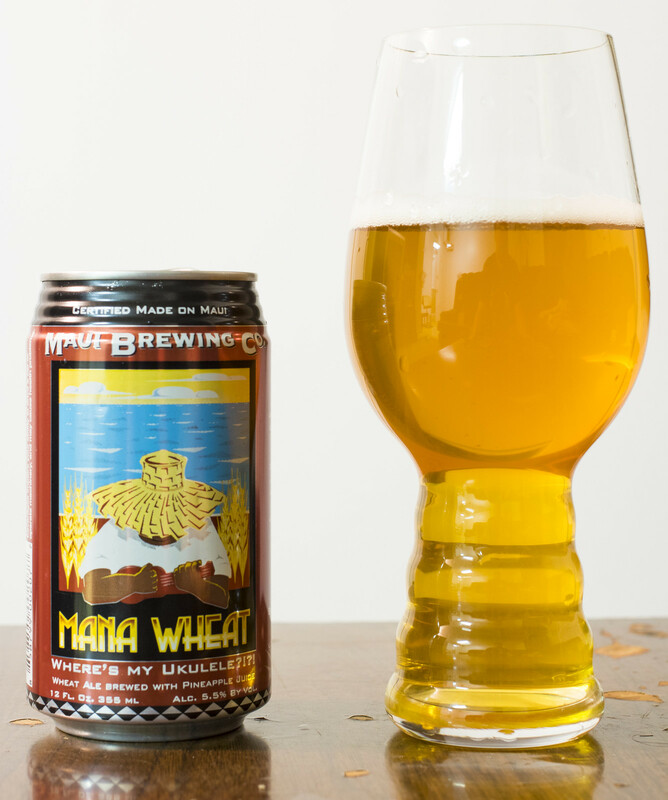 Then there’s also Mana Wheat, a wheat ale brewed with pineapple juice to give it a sweet, citrusy zest. This week I’m taking on Mana Wheat because.. well, I wish I was in a tropical destination with the roar of the ocean in my sight. With the slogan “Where’s my ukelele?” on the can, this is a beer that’s meant to enjoy, relax and savour. Pouring the Mana Wheat, it’s showing as a light, mostly-filtered wheat ale with only a hint of cloudiness in it. There’s a good amount of carbonation taking place with the beer leaving a thin amount of snow white head on the top of the glass. The aroma is like being at a small ocean side café for breakfast as it has a bit of a fruit salad with mostly pineapple, apple and I think a hint of pear. I’m also getting some wheat husk graininess in the aroma as well as a very light grassy hop note to it, making this a very easy to.. uh.. smell beer. The taste gives off more of the graininess of the wheat as it’s giving me a bit of a light biscuit flavour, as well as a hint of pepper from the yeast being used in this beer. The tropical flavours are kind of mixed for me as I’m getting a great presence of pineapple juice in the beer.. but I’m also getting a bit of a medicinal bitterness for an aftertaste which makes me cringe… but the bitter aftertaste is only there momentarily. Photos: Cody finally visits Unibroue!